Congratulations on your purchase of the BOSS GT-1 Guitar Effects Processor. 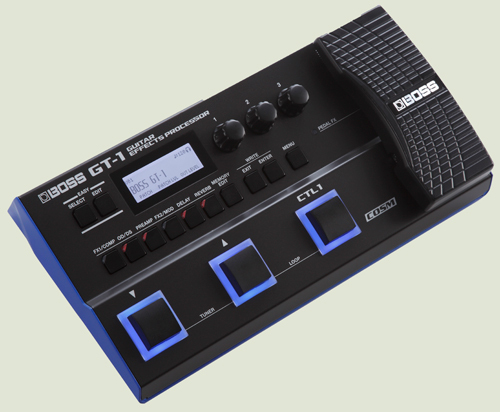 Ultra-portable and easy to use, the GT-1 delivers pro-level tones everywhere you play. Driven by the powerful BOSS GT-series engine, it gives you access to a huge selection of world-class amps and effects for all types of music. Equally suited for beginners, weekend warriors, and traveling players, the GT-1 packs premium sound in a compact and rugged package. We're excited to have partnered with the tone masters at BOSS to offer you a free one-month all-access trial of G-PASS. With your G-PASS membership, you get unlimited access to all of the exciting content here at GuitarInstructor.com—that's over 30,000 guitar tabs, video song lessons, video guitar lessons, backing tracks, and more, including the guitar play-along tracks for the 80 classic hits listed below. All you need to do is click the "Redeem" button below, then register for your free account, and you'll be free to explore the amazing content we have to offer. When your free trial period expires, you can choose to continue using your G-PASS for our low introductory rate of just $9.99 per month. For even greater savings, sign up for a full year of G-PASS for just $99.99! Following is a list of 80 classic hits for which the tone experts at BOSS have created the matching guitar sounds (available for download into your GT-1 at BossToneCentral.com). There are two versions of each song—one is "Minus Guitar," in which the main guitar part has been removed from the mix, allowing you to play the part completely on your own, and the other is "Full Band," which contains all the guitar parts. If you want guitar tab for the tracks, use our Advanced Search and enter the name of the song, and under the Media Type dropdown menu, choose Guitar Tab Play-Along. Note that when you choose a song below, the link takes you to the song's preview page. To access the complete song, you must be logged in to your account and click "View Now" in the top right corner of the song's description. "Never Make Your Move Too Soon"
"The Only Daddy That Will Walk the Line"